Spring semester has concluded and summer is on its way—bringing with it more than one kind of hay fever. The Wellesley Summer Theatre Company (WSTC) is inspiring visitors to campus to have a little fun with it. 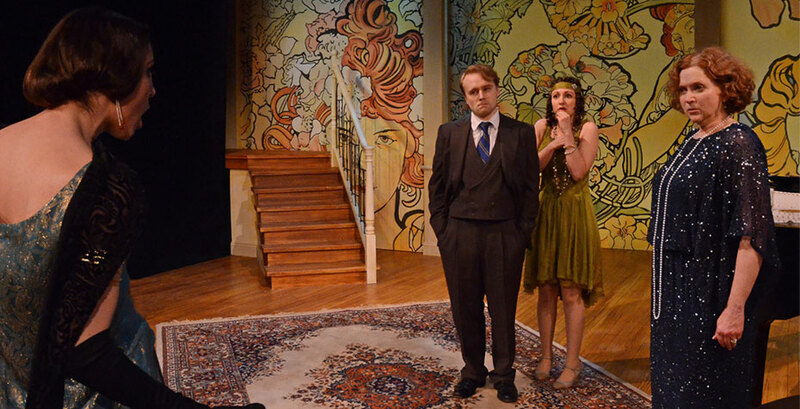 WSTC’s production of Hay Fever enjoyed a strong opening on May 29, and will run through June 22 in the Ruth Nagel Jones Theatre. This Noël Coward play follows the Bliss family through a summer weekend at their English country home with a motley assortment of guests. As the Blisses’ behavior becomes increasingly outrageous, their guests flee the madness—while the family is too caught up in their own drama to notice. Rainer’s experience with Wellesley theater can be traced to her time as a student, when she served as president of the student improv group Dead Serious, and she is currently a visiting lecturer in the Department of Theatre Studies. Rainer is an actor, director, published playwright, and teacher. Her most recent show with Wellesley was as director of last’s years Wellesley Summer Theatre production of Dancing at Lughnasa. The talented actors to which Rainer refers include a Wellesley alum and three current students: Sarah Barton ’02 (profiled recently in the Metrowest Daily News), Angela Bilkic ’15, Catherine Piner ’16, and Elisabeth Yancey ’16. The cast of nine is completed with acclaimed local actors, appearing courtesy of Actor’s Equity. Tickets are $20 general admission, $10 for seniors and students. To reserve, call 781.283.2000, email tickets@wellesleysummertheatre.com. Guests are also invited to visit wellesleysummertheatre.com for show times and information on upcoming shows, including the Wellesley Summer Theatre for Children production of Wind in the Willows, June 21-22.